Wider edgelines may cause drivers to feel the need to drive closer to the centerline because of the narrowing feeling. Edgelines are used to guide drivers on roadways. By having wider edgelines, drivers may feel the need to drive closer to the centerline because of the narrowing feeling. Mixing this feeling with the fact that drivers are closer to oncoming traffic should slow drivers. Earlier crash studies conducted on wider pavement markings were inconclusive and showed no particular benefit. 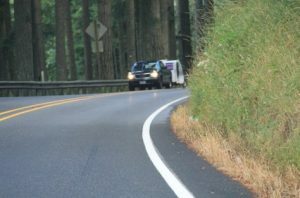 However, current research using the latest statistical analysis techniques shows the potential benefit of wider pavement markings on rural two-lane highways. For instance, edgeline width has been found to statistically lower nighttime fatal and injury crashes in an ongoing analysis of two state’s data, which is particularly useful since the nighttime crash rates is approximately three times higher than the daytime crash rate. The Crash Modification Factors Clearinghouse provides crash modification factors (CMFs) of 0.57 to 1.05 for severe crashes during installation of wider markings without resurfacing.